It 10 days since I had a walk along a beach. Until this afternoon, I had not been on a beach since my holidays in Rethymnon on the Greek island of Crete came to an end on Wednesday of last week [20 July 2016]. A walk on the beach in Bray, Co Wicklow, was not an option last weekend, knowing that the seafront was going to be crowded with people attending the Bray Air Show, so two of us went to Farmleigh and the Phoenix Park instead, and walk around the boating lake. And on Sunday we had a long, lingering lunch with friends from Christ Church Cathedral, that stretched well into the late afternoon. But this afternoon, two of us got to Bray in the late afternoon, and first had a late Saturday lunch in Carpe Diem – including doubles espressos and a glass of Nuragus. Nuragus is a white Italian wine grape variety that is grown in Sardinia. It has a long history on Sardinia and may have been introduced to the island by the Phoenicians. The grape is still widely planted in Sardinia, but its numbers began to dwindle in the late 20th century, falling by 50% during the 1980s alone to a total of 8,700 ha in 1990. Today it is mostly found in the southern part of the island, between Cagliari and Oristano on the hot Campidano plain. Under Italian wine laws, Nuragus grown in southern Sardinia may be labelled under the Nuragus di Cagliari DOC, as long as the grape makes up at least 85% of the blend with other local white grape varieties. Well-made examples of Nuragus have aromas similar to Vermentino with almonds and sour apple flavour notes. It has been compared to Portugal’s Vinho Verde and Spain’s Albarino wines. From Carpe Diem, we went for a long walk on the seafront. The tide and the waves were gentle compared to the tides and the waves we had experienced on the beaches in Rethymnon earlier this month, and – while it felt more like an autumn day than summer – a few people, and a dog or two, braved what must have been chilly waters for a swim. We walked as far south as the bay below Bray Head, then retraced our steps and walked as far north as the harbour, where there was no sailing but a large number of swans. The sea front is busy with a fun fair, and just as our walk came to an end the sun began to come out again. In recent days, I have written about two interesting houses on Orwell Park in Rathgar: No 4, which was once the childhood home of the playwright John Millington Synge, and Dartry House, which as Darty Hall had been the home of the towering business figure of early 20th century Ireland, William Martin Murphy. But without doubt my favourite house on Orwell Park is Fernhurst or 14 Orwell Park, a grand detached late-Victorian house. This house was formerly owned by the composer Bill Whelan, and came to public attention when it was sold for €3.795 million two years ago [August 2014]. It was sold through Sherry FitzGerald, and the original asking price was €3.795 million. When it was on the market two years ago, one newspaper report said Fernhurst is “considered the crown jewel of Orwell Park by many.” But I had a friend from Co Carlow who lived there in the early 1970s while she was a student, and I got to know and appreciate this house about 45 years ago. Fernhurst is a very fine Victorian detached house with intricate exterior brick and sandstone detailing. A landmark Monterey pine in the front garden shields the house from view. The house stands on 0.3 acres of grounds, and the property is deceptively large spanning a width that is between double and treble that of the average house on the road. One of the few remaining Victorian pillar boxes in Dublin, complete with its VR monogram, stands on the footpath immediately in front of the house. I suppose it is appropriate, then, that a vintage postcard of Horse Guards, London, that was sent to Master Kenneth Hope, Fernhurst, Orwell Park, Dublin, and postmarked London 1903, was offered for sale on eBay recently. Sadly, this pillar box is defaced with graffiti, and like most of those remaining and rare Victorian pillar boxes, this one is in the early stages of neglect and decay. For much of the 20th century, Fernhurst was the home of Robert Grove White, a Cork-born barrister, and his family. His wife Maud died in 1949, he died in 1960, and they are buried in Mount Jerome Cemetery in Harold’s Cross. The house measures 418 square metres (4,500 sq ft). Victorian tiling outside leads through the Gothic-arched front door and into the fine hall where all the rooms have ceiling heights of more than 11 ft, ornate architraves, pitch pine doors and floors, brass door knobs and fingerplates, as well as great panes of leaded and stained glass. The windows, while upgraded, retain their original mechanisms and Victorian style radiators heat the rooms. When the composer Bill Whelan lived there, his baby grand piano sat in the bay window of the double drawing room – a great space with interconnecting doors that slide back to reveal a room to the rear with ornate ceiling plasterwork and a mirror-image bow window. Bill Whelan is best known for composing a piece for the interval of the 1994 Eurovision Song Contest, Riverdance, the electrifying seven-minute reinterpretation of traditional Irish dance that became a full-length stage production and introduced Irish dancing to international popular culture. A family room on the other side of the hall is a cosier and equally well-used space. A door off it leads down to the double- height Victorian conservatory with a vaulted glass roof. A set of steel steps goes down to a limestone floored room. The dining room has had an unusual Venetian plasterwork treatment. A double-height French door leads the eye up to the vaulted ceiling as well as providing a snapshot view of the well-tended gardens. Adjoining the dining room is a John Daly-designed cherry-wood kitchen that includes a box bay window and window seat. On the hall return is a double-height stained glass window that floods upstairs and downstairs with warm washes of colour. There is another bedroom on this level. The three large bedrooms on the first floor all have 11 ft high ceilings. The master bedroom has an en-suite bathroom that includes a separate bath and shower. The family bathroom at the top of the house is accessed along a minstrel’s gallery and a bank of linen cupboards the size of an average bedroom. The bathroom has garden views. At garden level, two bedrooms share what the estate agents called a Jack-and-Jill bathroom. There is also a utility area behind a folding door. A den or games room to the rear has French doors leading outside to a granite patio. The gardens, adjoining Saint Luke’s Hospital, have a high laurel hedge to the rear and is formally laid out and carefully planted. As I passed Fernhurst earlier this week, the decorators were working in the bay window of the double drawing room, and I was tempted, just slightly, to knock on the door and ask whether I could see that Victorian plasterwork again. During one of my afternoon walks in the Rathgar area this week, I walked along Orwell Park, to photograph a house where the playwright John Millington Synge had lived during his early childhood, and then found myself at Dartry House, a house that I had known over ten years ago, and that has been impressively restored since then. Dartry House is an imposing two-storey mansion built about 1810-1840 with several later additions such as a turret which was incorporated in the building about 1900. It was originally built as Dartry Hall for Obadiah Williams, a wealthy merchant of Huguenot descent. From 1844 to 1849, Dartry Hall was owned by William Wallace, the proprietor of the Dartry Mill. In 1849, he sold the house to William Drury, and it remained in his family’s ownership until 1883, when the house was bought by the industrialist and newspaper proprietor William Martin Murphy (1845-1919), who was then living nearby in Rostrevor Terrace, Rathgar. Murphy was originally from Bantry, Co Cork. He moved to Dublin in 1875, and from 1878 he was living at No 7 Rostrevor Terrace. But within a decade of moving to Dublin he had moved into Dartry Hall. In Murphy’s days, the grounds of Dartry House included walled gardens and a tropical greenhouse. Murphy made a number of additions to the house, including the mansard attic rooms and a turret, which was built around 1900. Although the turret can not be seen by the public today, these additions create a the image of a French chateau or even a Disney-style fantasy castle to this house in quiet, secluded corner of suburban south Dublin. Murphy owned a number of businesses in Dublin, including the Irish Independent, Clery’s department store, the Imperial Hotel and the Metropole Hotel and the Dublin United Tramways Company (DUTC), and he was a central figure in the Dublin Lockout in 1913, when the union side was led by Jim Larkin. 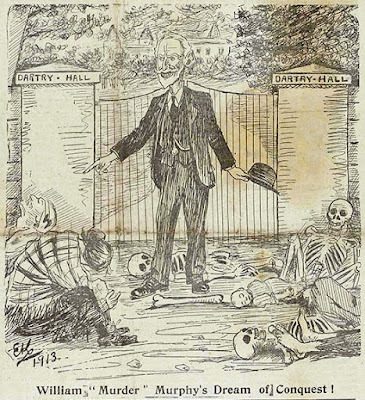 Ernest Cavanagh’s cartoons in the Irish Worker in 1913 depicted Murphy at the gates of Dartry Hall, and labelled him ‘William Murder Murphy’ and ‘The Vulture of Dartry Hall.’ The poet WB Yeats also expressed his disdain for Murphy in a number of poems that had an enduring impact on Murphy’s image in subsequent generations. The DUTC owned by Murphy built the tram line from the centre of Dublin to Dartry and the No 14 tram line came to an end at Dartry Hall. The terminus and the associated sheds now house an engineering firm. Murphy was a constitutional Nationalist, and was an Irish Parliamentary Party MP for Dublin Saint Patrick’s from 1885 to 1892. Murphy sided with the majority Anti-Parnellites when the party split. However, Dublin was a Parnellite stronghold and in the bitter general election of 1892, Murphy lost his seat to a Parnellite newcomer, William Field by a wide margin of 3,991 to 1,110. Murphy was offered a knighthood by King Edward in 1907 for his contribution to the Irish International Exhibition in Herbert Park, but it is said the offer was firmly but politely refused. With his father-in-law James Lombard, also a Nationalist MP, Murphy built hundreds of houses in the Dublin area. Murphy died on 26 June 1919 at Dartry Hall from a heart attack caused by aortic valve disease. He is buried in an unmarked vault within the O’Connell Circle in Glasnevin Cemetery, Dublin. Murphy was succeeded at Dartry Hall by his son, William Lombard Murphy (1876-1943), and his daughter Eva Magdalene Murphy (1883-1958), who stayed on at the house. 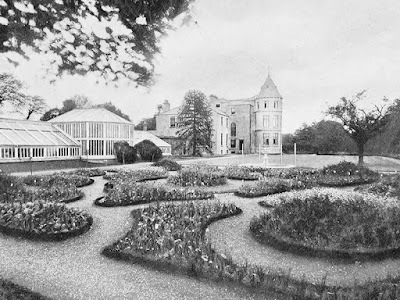 During the Irish Civil War, Dartry Hall was attacked by Republicans because a member of the family was a pro-Treaty member of the Rathmines and Rathgar Urban District Council. When Eva Magdalene Murphy died in 1958, Dartry Hall was sold by the Murphy family. It was bought in 1958 by the Mill Hill Fathers, a congregation of missionary priests. By then it was known as Dartry House. While the Mill Hill Fathers were there, the house hosted the offices of many mission agencies and voluntary organisations. I regularly attended meetings of the Irish Missionary Union and other organisations in the first decade of this century, until the house and its grounds were sold. Dartry House and about four acres of ground at Orwell Park were sold to Eugene Renehan of Walthill Properties for around €30 million in 2005. The house underwent extensive conservation and restoration works in 2008-2009 to provide seven new spacious apartments. The architects were Niall D. Brennan Associates. The apartments have views over and access to the listed formal gardens located beside to the house. The restoration works carried out to Dartry House sought to ensure that this building is retained as a pivotal focus for the surrounding area of Dartry and Rathgar. The rest of the site was developed with low-density schemes of apartments and houses. The site has a southerly orientation and backs on to a large belt of trees that divide it from Dartry Park and the River Dodder. Eugene Renehan had already converted the 18th century courtyard at Headfort Estate in Kells, Co Meath, into a residential area. His other schemes included the Moorings at Portobello Harbour and Rathmines Wood at Lower Rathmines Wood. The Mill Hill Missionaries used the proceeds of the sale to maintain priests returning to Ireland from the missions, and built a new house, Saint Joseph’s, on part of the original site. Six of the original and impressive granite entrance pillars at Dartry House are still standing: four in two pairs just off Orwell Park, and and a pair for a pedestian entrance on Dartry Road, near the old mill and almost opposite Tramway House.